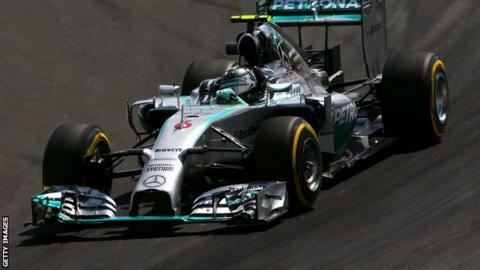 Nico Rosberg edged Mercedes team-mate and title rival Lewis Hamilton in final practice at the Brazilian Grand Prix. The German was 0.114 seconds ahead of Hamilton and has been quickest in all three sessions so far this weekend. Rosberg is keen to close Hamilton's 24-point championship lead, built up by the Briton's five consecutive victories ahead of Brazil. His apparent edge at Interlagos was helped by Hamilton's spin at Turn One in the first part of the session. Hamilton looked less comfortable in the car throughout the hour on track, locking wheels a couple of times and making a mistake in the middle sector on his quickest lap. The two Mercedes drivers look set to have a private battle - Rosberg was 0.429secs clear of the third-placed car, the Williams of local favourite Felipe Massa. Hamilton has a 24-point lead over Rosberg with a maximum of 75 points remaining - 25 in Brazil for a win and 50 in Abu Dhabi. The world title cannot be decided at this weekend's Brazilian Grand Prix. If Hamilton wins in Brazil and Rosberg fails to finish, he will have a 49-point lead going to Abu Dhabi. Hamilton would then need to finish 10th or higher to clinch the title. If Rosberg wins in Brazil and Hamilton retires, Rosberg will lead the championship by one point going to Abu Dhabi. Hamilton would then need to finish ahead of Rosberg in the points in Abu Dhabi to secure the title. If Hamilton wins in Brazil, with Rosberg second, Hamilton will arrive in Abu Dhabi with a 31-point lead. But if Rosberg then wins and Hamilton finishes sixth or lower, Rosberg will win the title. But rain, forecast for around the start of qualifying at 16:00 GMT, could shake up the pack, although the Mercedes has proved very fast in all conditions this year. Massa's team-mate Valtteri Bottas was fourth fastest, ahead of Red Bull's Daniel Ricciardo, McLaren's Jenson Button and the Ferraris of Kimi Raikkonen and Fernando Alonso. Raikkonen, who has had a disappointing season, was unusually quicker than Alonso, edging the Spaniard by 0.083secs. Button recovered well after a difficult Friday, following which he had said McLaren were "nowhere". The Englishman's team-mate Kevin Magnussen was ninth, ahead of the Toro Rosso of Daniil Kvyat and the second Red Bull of Sebastian Vettel. The world champion was struggling and finished 0.779secs behind team-mate Ricciardo. BBC F1 analyst Allan McNish said: "The two Mercedes are going to be nip and tuck. I was pleased to see Williams get up there and be best of the rest - I think they've got the best chance of challenging. "I'm sure Daniel Ricciardo and Red Bull will be disappointed after the pace they showed yesterday, but they struggled in the cooler temperatures today." What makes the Brazilian GP brilliant? Read more on Brazilian Grand Prix: What makes Interlagos brilliant?